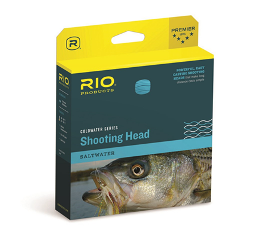 RIO Products has announced the release of a new full range of floating, intermediate and sinking shooting heads in its saltwater fly line series. Based on the popular OutBound Short series, the OutBound Short Shooting Heads offer a powerful front taper to cast large flies with ease and ensure long casts. Idaho Falls, Idaho (June 2, 2014 ) – RIO Products, industry-leading manufacturer of fly lines, leaders and tippet material, introduces saltwater anglers to a full range of floating, intermediate and sinking shooting heads in its cold, saltwater fly line series. Based on the popular OutBound Short series of lines, RIO designed the OutBound Short Shooting Heads with a powerful front taper to cast the largest flies with ease and ensure long casts. The front-loaded weight distribution quickly loads rods, while the step down taper at the back allows for very long flight times and easy distance. The heads are built two sizes above American Fishing Tackle Manufacturers (AFTM) standard to correctly load modern rods, so there is no need to step up a line size as it is accomplished for anglers in the design. The OutBound Short Shooting Heads work well from 50-80ºF and have Extreme Slickness technology to ensure massive casts every time. Available in ST7-ST10 weights, four density options complete any anglers’ arsenal – from full floating, to a sink rate of 1.5-2 inches per second (ips), 3-4ips and 6-7ips. The full floating lines are moss colored; 1.5-2ips are clear, 3-4ips are brown, and 6-7ips are black Each head has and Easy ID loop at the band end for quick recognition. Find any of these shooting heads at any RIO dealer for a retail price of $44.95. RIO is a pioneer in developing fly lines, leaders and tippet material to enhance fly fishing experiences across the globe. Offering premium fly lines for both freshwater and saltwater fishing applications, RIO consistently utilizes field experience and scientific testing to create the best products on the market for anglers. Founded 20 years ago in the mountains of Idaho, RIO continues to develop innovative products, design revolutionary tapers and refine performance-driven fly line technologies. For more information about RIO Products, please visit www.rioproducts.com. Connect with us through Facebook, Twitter, Google+ and Vimeo.